In Which Part of Life Do You Live: Past, Present, or Future? How much is well-being or its absence – depression and anxiety – dependent on what you pay attention to? I mean the present moment, the past, or your future? Does one best way to focus your attention exist? Philosophers remind us that the present is all we really have. The past is gone and the future might not come. Much effort is needed to develop and maintain this kind of “in the moment” way of being; daily meditation practice for the rest of your days. In doing so you can train the mind to stay in the present and refocus whenever attention begins to move toward a distraction, worry, preoccupation, memory, or anything else but your being within one second at a time. No before or after. No holding on to feelings. You observe the world rather than dwell on it. Thus, for example, pain is less fraught because you do not obsess about it. A benign sense of detachment comes to master meditators. They notice everything, but don’t pile meaning and intense emotion on everything, thus freighting the bad into something worse. Research suggests these are the most contented people on earth. Unlike the meditation experts, those in this group lead intense lives. Their openness allows for much joy, as it does for sorrow. At their best they are unguarded and brave. I am not speaking here of people with ADHD, who risk being caught in a whirlwind of thoughtless and impulsive action, untroubled by the past or future. Rather, I refer to those who are free with themselves, not self-consciously governed by what others might say or see. They are quite natural, unaffected, and spontaneous. Their self (and self-consciousness) is lost. Such lives are not full of rigid angles and rectangular shapes. They don’t always conform themselves to boundaries drawn on hard surfaces, as one must in formal sporting events, with perimeters decisively marked as fair or foul, in or out. Think ocean or sky, not ground, when you behold them: creatures who swim or fly. Theirs is a life of discovery and bright eyes. They wish to play, not keep score; celebrate while the sun still shines. Some suggest, however, we be careful of too much “in the now” living as defined by the first two paths. Isaiah Berlin, the philosopher and social/political historian, thought the detachment achieved in a Buddhist type meditation (Category #1) could be a cheat of life experience, a kind of defense mechanism against injury; valuable, but missing the full essence of life. Those taken by the moment (Category #2) also risk some of the avoidable misfortunes that those who spend more time looking ahead might dodge. Members of this group would push back, however, claiming the reward of emotional and behavioral vulnerability is worth the risk. Take opportunity on, they might say: this life is the performance and not the rehearsal. Nor should we forget, people suffering from Borderline Personality Disorder (BPD) are characterized as living in painful extremity too often. They can miss or discount the notion that nearly everything they are feeling at this instant is temporary, therefore potentially succumbing to passing emotional catastrophe. For them “the now” seems endlessly excruciating. Want some homework? Ask yourself which “time zone” you usually occupy and which makes you happiest. Stay tuned. One of my upcoming posts will deal with living in the past, which also has its ups and downs. An essay on future orientation will follow, along with some thoughts about the three types of time-focus and how to manage them. The second image is Macaca fuscata in Jigokudani Monkey Park – Nagano, Japan, by Daisuke Tashiro. It was sourced from Wikimedia Commons. We think of the rule as a “curse,” one of life’s biggest problems, even if not much discussed. We therefore try to disguise our “averageness,” overcome it, hide it under a sofa. When it doesn’t fit we get cosmetic surgery, tutoring, and take courses to improve our college entrance exam scores. Or lift weights, get tattoos, use makeup, wear fine clothing, comb-over a receding hairline, and rent the right apartment in the tony neighborhood. We even cheat on tests. Have you ever met a person who prefers mediocrity? Who shoots for a pedestrian education at a run-of-the-mill school; or wishes he’d come from lackluster parents? “My dad is more average than your dad!” is not heard on the playground. We don’t want an undistinguished job at an average salary in an unremarkable town. There are no more small ponds. That is, you can’t easily be a “big fish in a small pond,” a standout in a village. TV, the internet, and the global economy make comparisons with the best people worldwide inescapable. Many others are trying to “pretend” they are not forgettable. We often compare ourselves – knowing our personal deficits all too well – to the surfaces and self-reported glory of those who aren’t always honest in portraying themselves. Life isn’t fair. The Theory of General Relativity had already been invented when you were born. Doing it a second time gets you no points on your score sheet. Nor can you split the atom or invent the steam engine. We tend to compare “up.” We might remind ourselves that we aren’t at the bottom of the scale, but are more inclined to make comparisons with those we believe are “better off” and more worthy. Much of the First World encourages the lie “you can be anything you want with enough effort.” Tell that to the guy who can’t tie his shoes but expects to compete in professional basketball or the lady who fails high school algebra and still wants to win a Nobel Prize in Physics. The media singles out the one person who triumphed over astonishing odds as an example of what is possible, not the tens of thousands who did not. We believe the media. All of us have been transformed by evolution. Our ancestors succeeded in producing offspring who survived. Being above average tended to help in finding healthy mates and outmaneuvering bad guys. We instinctively aim for the same goals. There is no escaping the bell-shaped curve. Think about intelligence. Assume all people fit into the bell-shape below. As one moves to the right of the tall vertical line marked 100, you find those higher in IQ (intelligence quotient). Moving from 100 to the left, the IQ scores get lower. Fifty-percent of all people fall below the arithmetic average of 100. Yikes! THE GOOD NEWS: Being average doesn’t consign you to life’s landfill. If you don’t believe me, read The Invoice. You have not only the inherent worth of your humanity, but whatever contributions you can make to society, friends, and family, even if those acts are not recorded in the history books. By the way, my contributions won’t be there either. Be the best you can be, which in some areas may be above average, in others not. Giving maximum effort is within your power, even if sometimes you will only get a mediocre result. Such is life, no matter what you are told. Be defiant in the face not just of worldly injustice, but nature’s random assignment of physical and intellectual gifts. Rip your life from Mother Nature’s hands and remake the internal qualities still in your control. I have watched some of those gifted in the unequal genetic lottery – people of towering intellectual firepower – sink under the weight of a self-imposed desire to be “great” in the judgment of the world. They are like the mythological Icarus, who thought he could (and should) fly close to the sun, not remembering his wings were made of wax and would melt. Icarus fell to earth. Some journeys are just too dangerous and difficult for all but a tiny few. Some journeys are not necessary unless your make them so. You can enjoy most other trips as long as a rarely achieved destination is not one of your requirements. Near the end of our days most of us keep our own score – or no score at all. “Not everything that can be counted counts, and not everything that counts can be counted,” as William Bruce Cameron wrote. You cannot make yourself grow six more inches, but you can change your character, make yourself proud of yourself because of your virtue and acts of kindness or fairness, emotional generosity or courage. We must accept some of our limitations. Socrates, still discussed over 2400 years since he died, was said to be a homely, penniless man. He was not concerned. He also married a woman who wouldn’t stop criticizing him. He wasn’t much concerned about this either. Be like Socrates but marry better. If you stop condemning yourself for “not measuring up,” then you will have more time to enrich your humanity. The loftiness of your character is in your power. If you become an honorable person who demands basic decency of himself, not just others, you will have accomplished something beyond price or rating. The top image is called Daruma by Soen Kogaku. It is sourced from Wikiart.org/ The Bell-Shaped Curve comes from IQ Test Labs. Is a gold medal the key to happiness? The man in the picture won one, but I’d not suggest you aim for something similar. Happiness is not in the precious metal medal. In fact, Steve Henikoff — the happiest man I’ve ever known — never strove to win it. I had a Thursday dinner with Steve. 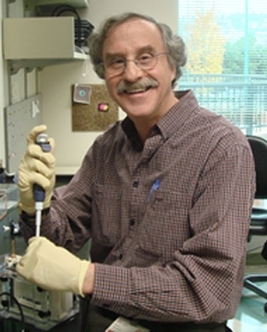 He was in Chicago to receive the Genetics Society of America Medal for outstanding contributions to the field of genetics in the last 15 years. The award itself takes the form of a very heavy, circular, gold paperweight inscribed with his name. Steve and I go way back, to sixth grade or so. He was a curious kid, interested in many things: from photography to music, from chess to skiing, from crossword to jigsaw puzzles. Even Mad Magazine. And he was a passable softball and basketball player, just one of the guys you wanted to be around and who wanted to be around you. But Steve had a greater gift that went unnoticed at the time: to enjoy whatever he was doing. Sounds simple. Try it sometime and you’ll find it isn’t so easy. Please understand, Steve was delighted to receive the award, but that is not the secret to his happiness. If you read the rest of the GSA’s press release, you will note words like “visionary,” “influential,” “landmark research,” “inspiring,” and “generosity.” Yet, none of this high praise has much to do with happiness either, except the last of those words: generosity. Steve loves to collaborate with others and mentor young scientists. Like nearly everything else about his vocation, those activities are unselfconscious and fun. The hitch in achieving moment-to-moment happiness is something called “hedonic adaptation.” We are built to quickly return from a high or low point — a great achievement or a heartbreak — to our relatively steady state of emotional functioning. Put differently, we live on a “hedonic treadmill,” only temporarily able to get higher than our own “normal” mood. The new car smell doesn’t last, the raise in salary is yesterday’s news, and the thrill of a better job title is pushed aside by growing ambition and a bigger goal. That’s where Steve’s model is instructive. He was thrilled to win the award, but you can’t win gold medals every week. What then? Must you work into the dead of night figuring out how to boost your well-being? He doesn’t meditate about life satisfaction, he lives it. His high-powered brain does not over-think. Dr. Henikoff is at ease with himself, having fun — yes, fun — in the full-immersion joy of invention and discovery. SH loves to think about his research, talk about it, solve scientific puzzles, write about the work, and discuss his findings with others. Steve thrills to spark the minds of young scientists. He lives in the moment, having the kind of good time we all once did — when we were preschoolers playing games, learning new things, and exploring a world where everything was fresh. All before we began to worry about what others thought about us and punish ourselves to succeed. Steve Henikoff has not lost the childlike wonder of a new day. He cannot wait to get to his lab and do work that is not work, but play. The Professor doesn’t puzzle much about philosophical stuff. He is pleasantly busy with those tasks he has identified as the most important in his life. He achieved success not because he strove for it, but because the involving and enjoyable work was so well done, it caused others to notice. Had you given him enough to eat, a decent place to sleep, and a lab to work in, I believe he’d have been just as pleased on a daily basis even without recognition. Oh, yes, he might have required some clothing, too! I must mention his comely and compatible collaborator and wife, the brilliant Jorja. Both his happiness and his work — their work — are completed by her presence. A woman he knew, after only six weeks, was perfection. A young lady he married in just that time, over 40 years ago. Steve creates for the love of it. He is content learning, doing, and mentoring. It is not as though he has avoided losses, including those dear to him. But Steve’s attitude is simple. Loss is in the nature of things. There is nothing to do but accept it and, before long, jump back into the pool of life. The water in which my friend swims is not untroubled. The academy is a competitive pond, full up with sharks. But Dr. H. has the gift of buoyancy. Moreover, he does not add the unnecessary weight of hoping for a bigger home or fancier clothes. Little thought is spent on those concerns that might distract and destroy this scientist’s equanimity. He doesn’t have to screen them out. At “work” they are simply absent. Look at Steve’s smile in the top photo. Why is Dr. H. so happy? For him it was just another day at the office, doing the magic he was made to do. Who among us could wish for more? The top photo is of Steve in his lab. The second image is a 1974 snapshot taken in Boston. 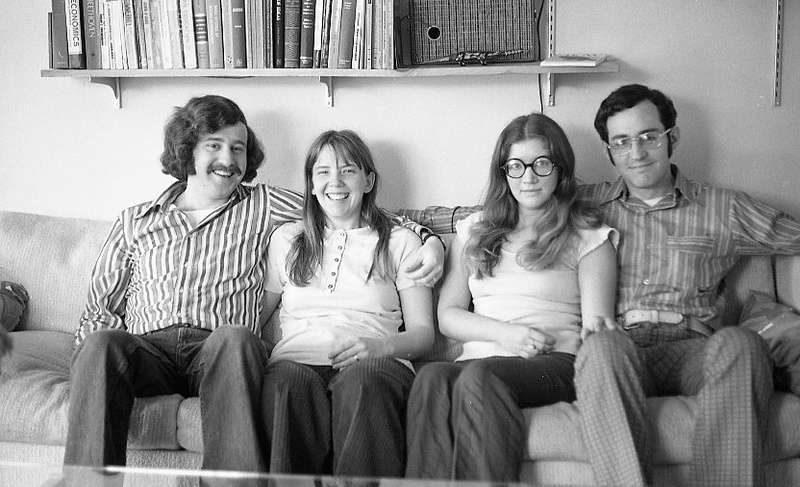 From left to right: Steve and Jorja Henikoff; my wife, Aleta; and yours truly. Unfortunately, all this planning to avoid going wrong and retrospective analysis of where we went wrong can make it harder to be happy. Today, I’ll give you one thing to do that will be fun, won’t cost you anything, and is repeatable as often as you like. I’ll talk about a city walk where most of us are intent on our destination and want to arrive promptly. We focus on what we are going to do later or troubled about some other problem. Instead, be alive to the walk — the people, the sidewalk, the architecture — the tops of buildings you rarely view. Be alive to the sounds, the birds singing, the trees rustling and moving. Remember when you were a kid and you witnessed the movement of clouds, entranced for minutes at a time? Be a kid again. Be amazed again. Do you recollect when you were a child in the back seat with adults in the front? Recall watching the cars go by, the trucks go by, and the train crossings. Remember counting the Buicks or the box cars? Recall getting dizzy looking at the passing train? Remember deciding to count just one kind, one make, or one color of automobile? Remember how easy it was to make life into a game? What will you see on your walk? What will you be mindful of? What will you notice? People carrying things, carrying themselves. The gyros, hot dog, and bakery scents. The wide, the narrow; the tall, the short. The high heels, the low heels, the flats, and the sneakers. The covered up and the uncovered. The mini-skirts and the maxi-dresses. The muscular and the thin, the shapely and the ship-shape. The round and the right-angled. The ones looking at the jets or listening to electronics or talking to their neighbor. The loping, the slouched, the upright, and the just right. The smiling, the laughing, the sad, and the studious. The shirts (with their ties) or school names or favorite team logos. The beautiful and all the in-betweens, and not quites, and almosts. Street noises; even the screech of the trains. The hurried and the evenly paced. The things omnipresent, but never seen. The lightly dressed and the rightly dressed. The blind, the sighted, and the bespectacled. Skin: the yellow, the white, the caramel colored, the deep brown, the black, the sunburned. Canes and metal walkers; the walkers walking with walkers. The men holding hands, the women holding hands, the babies being held or pushed, the men and women holding hands, the parents holding hands with their children. People making speed and men making time. The warm and the cold, the hot and the cool. The carefree, the careworn, the careless. Hair styles, hair blowing, hair color, and the hairless. The cigar smoke, the sewer steam, the cigarette smell. The light and the dark and the blank expressions. The faded, the fading but still fabulous. The kids, the teens. The no-timers and the old-timers. The frail, the fraught, the frowning, and the robust. WELCOME TO THE WALKING SHOW! WELCOME TO THE FESTIVAL OF LIFE! Here is an entertainment without an admission fee: a new show every day, every minute, every night. No reruns, no DVDs, no downloads — one time only and gone. This constellation of faces and bodies, of sun and clouds, of moving cars and trucks disappears as soon as you stop to think. Don’t think or you’ll miss the array; miss the “hurrah” in the array. The kaleidoscope is only there if you notice. The fragrances are only special if you don’t preoccupy yourself with all the junk in your head. All the people are only special if you make them so. This pattern of sounds will never be repeated. A new symphony every second. The pattern of light and shadow will never be seen again. No one, not even someone walking beside you will experience the spectacle exactly as you do. Your perception is unique. The faces on the people will never be the same, not even tomorrow when they are a day older. Get out of your mind ahead. Get out of your mind behind. If you do, prepare to be dazzled. Cover the internal mirrors looking back at you to enjoy what is outside, not the tempest inside. Don’t judge what you see, don’t reflect, just observe. 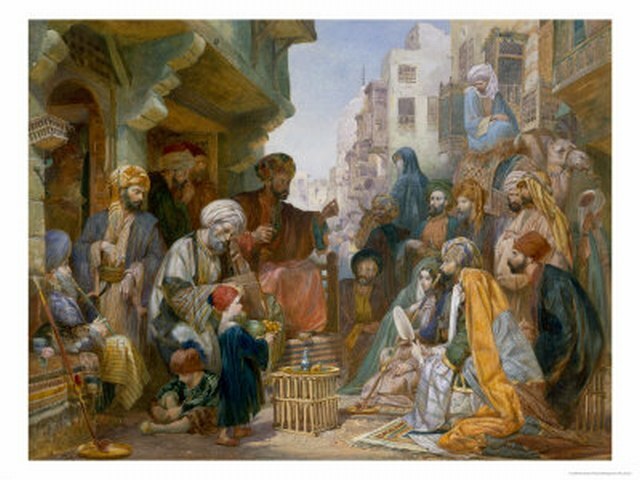 The top image is a 19th century Turkish street scene painted by Amedeo Preziosi. It was sourced from Wikimedia Commons. Imagine a beautiful, wealthy young woman. She falls in love with a man named Compeyson, who cares only to make off with some of her money. On her wedding day she discovers the fraud and is left at the altar. From that day forward, she lives in a state of mourning, continuing to wear her wedding dress as a badge of her perpetual sense of victimization. The cake is left on her dining room table uneaten. Perhaps you recognize that I’ve just described Miss Havisham, an important character in Great Expectations by Charles Dickens. A wasted life, I expect you would say. A mistake never to get over the lost love and the humiliation. Surely people aren’t like that, are they? Yes, I’m afraid, some are. Their dysfunction is less obvious without the yellowed wedding dress and the uneaten cake, but it is still there. Another example: imagine a man who wants a career in high finance, a tough and competitive road to travel successfully. He’d trained for it and worked hard to get to the top. For a time he was making his way up the administrative ladder within an important bank in a big city. Then an economic downturn and a change in management caused a corporate reshuffling. His career never recovered and he never again worked in his chosen field. While he made an acceptable living, his mind always returned to “what might have been.” It remained hard to feel satisfied with the remainder of his work or his life. That life would have been great if only the man could have achieved success in his chosen profession. That life cannot be satisfying for him in any other field of endeavor or by any other means. Psychologists who do research on what makes for happiness might disagree. And, in fact, that research tends to support the idea that the flush of excitement and happiness that comes with winning the race, new romance, or a major achievement doesn’t last nearly as long as people expect it to. We humans tend to be pretty poor at estimating the accuracy and durability of what will make us happy. For example, Daniel Kahneman and David Schkade took a look at what effect living in a nice climate might have on life satisfaction. Students living in California and the Midwest were recruited for this experiment. In general, regardless of where they were going to school, the college students tended to think people would be happier living in California. But, in fact, there was no difference in the life satisfaction of those who lived in the harder climate conditions of the Midwest than in the milder ones associated with the West Coast. In part, it would appear, we are prone to focus on items like climate that we will become accustomed to as time passes. Similarly, you might be delighted over the terrific new car or new house you just bought, but it is likely to recede into the background of your life as you get some distance from the moment you acquired it. Put differently, going out with Brad Pitt or Marilyn Monroe might be terrific for a while, but in a few years the dazzle and novelty tend to wear off. It turns out that life satisfaction and the happiness we experience along the way are strongly influenced by our inherited temperament. You can be fantastically wealthy and unhappy — or relatively modest in your level of success and affluence and be happy. Of course, this issue is much more complex than I am suggesting. But, if I were to prescribe a brief recipe for happiness, it would have to do with making a decent enough living at labor you deem worthwhile to live modestly but well (research says that a household income of $75,000 is usually enough) and having people in your life who you love and who love you back, both friends and relatives. One other thing: to some extent, happiness depends on what you are paying attention to. Kahneman suggests that misery can often be traced to having goals that are especially hard to achieve. A laser focus on obtaining great success in a performing art like music or dance or theater is almost a guarantee of continuing disappointment (since so few make it to the top). The danger is that those who aim for triumph in fields such as these tend to unconsciously make their entire happiness dependent on their level of achievement, to the exclusion of other factors that might contribute to a satisfying life. Of course, it needn’t be just an attempted career in the arts that frustrates a person. 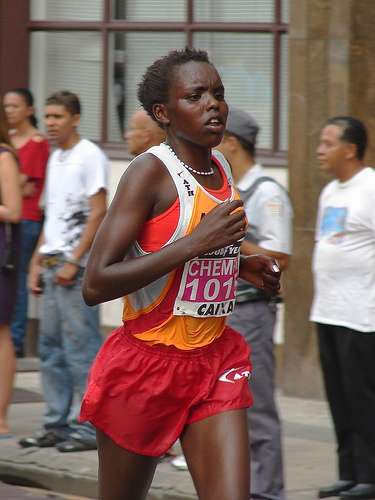 Athletic accomplishment at the highest level is only attained by the few. Nor are Nobel Prizes given out at the bingo parlor. If you pin your happiness on writing the “Great American Novel,” becoming the next Steve Jobs, or being a scientist whose name will still be in bold relief in the next century’s text books, you have almost certainly guaranteed a significant level of displeasure. What then does this say about all the rest of us? Especially in our attempt to get over the failures and rejections by employers and lovers that are the commonplace experiences of life? The disappointed banker I mentioned earlier would have to reorient his thinking, get over his defeat, and “invest” himself in some new line of work or another facet of his life — like family, community, friends or hobbies. The same might be said of the baseball player who never becomes a Major League star or a physics professor who never produces the scientific breakthrough he was hoping for and continues to work at it into his old age, never giving up or accepting that he didn’t become the man he hoped to be; never satisfied by the work itself as opposed to the glory he hopes will come from it. What is preventing these men from feeling happier about their lives? Perhaps it is their belief that a satisfactory life amounts to winning a figurative pot of gold at the rainbow’s end of their career, as in the top image; not necessarily money, but a kind of vocational or social jackpot. In part, this self-imposed requirement makes it harder to grieve their losses. They continue to focus on what might have been or what might still be. The failed banker is looking back on the career he wished he had and re-running the same old movie of his life with the same old unhappy ending, even before that life is over. The physics professor is still trying to produce the next major scientific discovery, not willing to accept that his colleagues have already rendered their verdict on his work. The former individual replays the lost ballgame of his life 10 years or more after it ended, while the scientist continues to play the game into extra innings without progress, even after the fans have left the stadium and the lights have been turned off. The tyranny of “what might have been” can be the equal of “what might yet be” in its capacity to diminish those lives that might be good in every other way. The mistake of giving up too late or not at all on a fruitless pursuit is just as costly as “giving up too soon” on one that would have been profitable with more persistence. You needn’t be a great man or woman in order to have a satisfying life. If you must become a financial wizard or a Nobel Prize winning scientist, then you have probably overestimated the importance of these endeavors and undervalued the other possibilities in your life, including the things you might already have: interesting work, health, love, and some amount of admiration by others, even if the latter quality isn’t as much as you wanted. Miss Havisham, the failed banker, and the perpetually striving scientist have all made the mistake of believing that their happiness depended upon a particular thing; and by failing to grieve when that thing wasn’t achieved. They have idealized what a life with that thing would be like (be it a particular spouse, money and status, or scientific achievement and glory). Each one remains stuck in a state of bitterness (Miss Havisham), disappointment (the banker), or longing and frustration (the scientist). Others, with less fixed goals and more intellectual and emotional flexibility, would be unhappy only temporarily, eventually withdrawing their emotional investment in what they never had; moving on to find some other focus of their attention and effort. As the title of this essay suggests, it is important in life to learn how to lose; how to give things up and set them aside. In fact, I’d argue that this is more important to life satisfaction than victory in the game of romance or your chosen profession, which, unless you are Einstein, will probably be pretty modest. I suppose that my suggestions here would result in fewer scientific breakthroughs and fewer great violinists. On the other hand, there would be more happy people. Even on the day after you take home the Nobel Prize, should you be a genuinely great man and a lucky winner, you must deal with the fact that there is still the laundry to do. Even after winning the fair maiden, there are still bills to pay, children to raise, and differences over which movie to attend (and worse). Most of us frequently misunderstand that the object we are chasing usually doesn’t make that much difference to the rest of your life, even if it seems desperately important at the moment. Unless of course, you think it really does make all the difference; which means that the problem resides in how you think about it. If you must be a big-deal banker or a Nobel Prize winner, then I guess you will keep gnawing on the meatless bone of your failure or pursuing the miniscule possibility of a late success. No, you shouldn’t be a bum and automatically give up some admirable goal, especially if you are young. But, I am here to tell you that the goal you have believed all your life to be essential to achieve, just might take you off course and your chance of satisfaction with it. Sometimes only by accepting your losses can you make your life into a winning proposition. 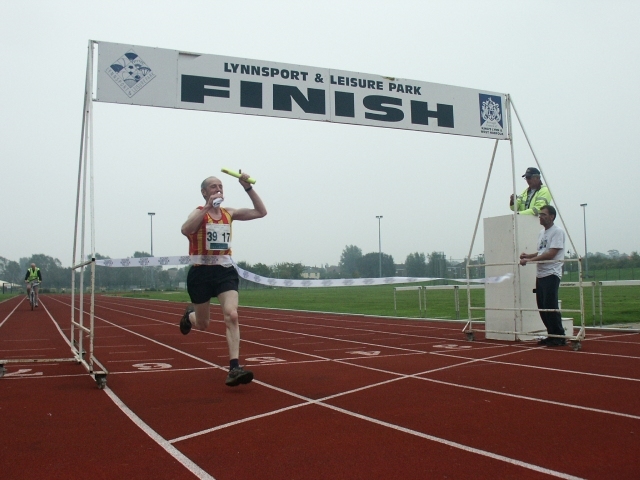 The End of the Norfolk Relay 2006 at the Athletics Track, Lynnsport. 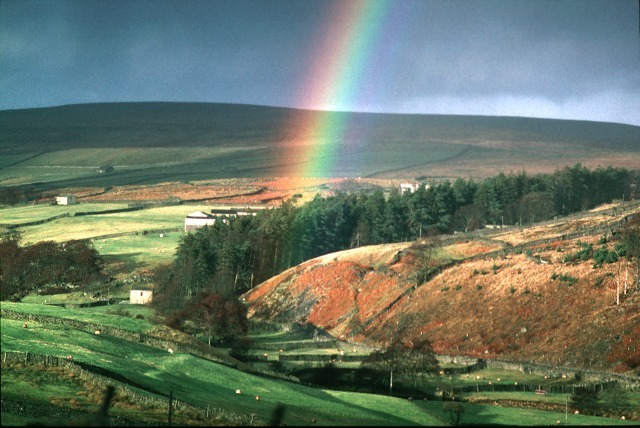 The top image is called Pot of Gold in Arkengarthdale by Andy Waddington. 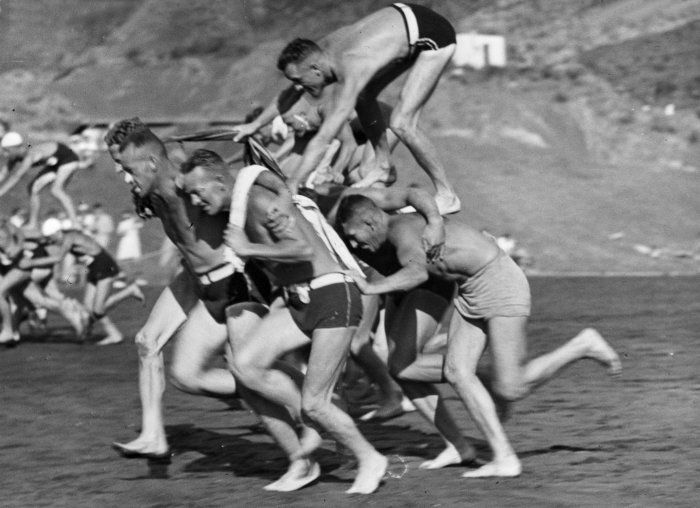 Next comes a photo of Men Running in a Chariot Race at the Piha Surf Club Carnival in New Zealand, ca. 1938 sourced from the National Library, NZ. The picture of Chemutai Rionotukei is the work of Ricard from Sao Paulo, Brazil. Finally, the relay race photo was taken by Katy Walters. All are sourced from Wikimedia Commons.